The ChiTech Drumline program is in its second year and has continued to expand. ChiTech now has two drumline classes available for juniors and seniors. Students in Music Production work on a variety of compositions for acoustic instruments and digital audio. The first semester of the 2016 school year culminated in students creating original compositions designed to boost productivity for a range of tasks. Music students at ChiTech have the option to take classical guitar and work with expert instructors from one of our partners, Lead Guitar. The Shift to Project Based Learning. 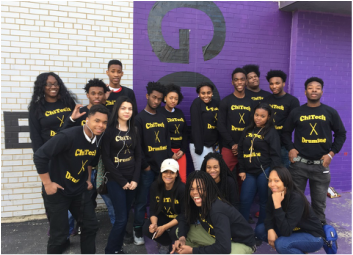 ​Learn more about the transformation of Chicago Tech Academy from a traditional high school to a project based learning school with ​The Shift at ChiTech.